Where is the sunshine? !.....I hear that some parts of the country have glorious sunshine but it certainly isnt anywhere near Coventry. We have seen the odd glimpse that looked promising but it seems to have disppeared completely now. Here is a card for the challenge over at Penny Black Saturday Challenge which is Anything Goes. The image is called Hobble & Cuddle and is coloured with Prisma and Polychromo pencils. 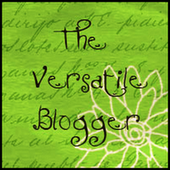 I must also just say thank you for the Versatile Blog award that I received this week from the lovely Clare and also the lovely Christine . I think I am going to have to opt out of passing this on simply because I have tried to pick 15 blogs and it is just so incredibly difficult. I feel that you all deserve to have the award from my blog so feel free to grab it and display. Thanks ladies for passing it on and picking me as one of your choices. I hope you understand. Hi Sally, this is so cute just love the colours and the layout is fab. Gorgeous Sally, love the image and fab colours! So lovely Sally! That paper just makes the image pop and the ribbon is perfect with it!! Congrats on the award too - so well deserved honey! Lovely card with that cute image and the wonderful ribbon and bow. Love your colours!